A couple of weeks ago I linked to a paper predicting that China’s growth would start to slow down in about five years, when its per capita income reaches $17,000. The authors based this on a comparison to a set of other countries that had also experienced high growth rates but eventually slowed down. To try to get a better grip on the situation, I did two things. Firstly, to formalize the instinct that the US has been at/near the productivity frontier at most times, I expressed every country’s GDP/capita as a fraction of the US value in the same year. Then I started kicking countries out of the sample, unless they met the following criteria: they started out the sample clearly less productive than the US (I took less than 60% as my threshold), and ended up significantly more productive, relative to the US, than they had started out. Ie, we want countries where it’s somewhat plausible that there’s a story of underdevelopment, period of rapid catchup, followed by slowing growth once the country is a fully developed country with modern capital infrastructure and levels of productivity. 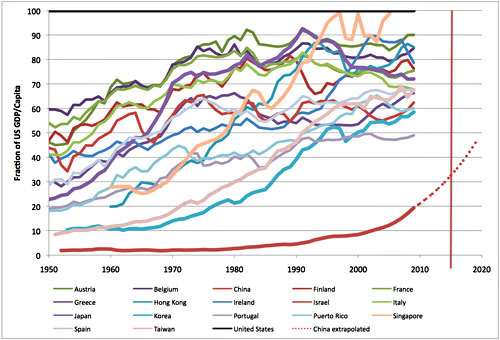 Long story short, Stuart produced the chart below, which suggests China can keep growing at a fast pace until its per capita income is somewhere in the $25,000 range, which is probably still 15-20 years away. I don’t have the chops to adjudicate this, but I thought it was worth highlighting a contrarian opinion anyway. China might very well slow down in the next five or ten years anyway, since it faces multiple constraints (resource scarcity, productivity limits, demographics), but the $17,000 limit is just a guess, and you should probably put some fairly large mental error bars around it.